Our 62.5/125 multimode (mm) pre-terminated fibre optic cable is available in a choice of lengths and the fiber comes pre-terminated at both ends with connectors of your choice including ST-ST, ST-SC, SC-SC, LC-LC, LC-SC and LC-ST and in a variety of convenient lengths between 10m and 200 metres. 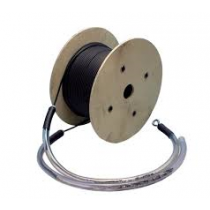 Tight Buffered for Indoor & Outdoor cable runs. We can also manufacture alternate lengths if required, so if you cannot see the length you need please call. Once terminated we will perform rigorous tests to ensure the fiber cable meets industry standards. Test results are supplied with the cable. To avoid damage the fibre is protected with an armoured plastic tube, completely covering the terminated fibres. 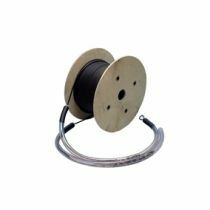 The tube in turn has a Kevla™ pulling eye so even difficult cable runs can withstand a greater pulling strain without damage the fibre. 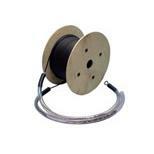 4 Core Pre Terminated fibre Lead 62.5/125 OM1 Tight Buffered.